Sending my dear readers-a bouquet. The white is a symbol of the unexpected snow we had last week. Part of me felt sad these roses didn't smell sweet. And most of me was joyful, because they were a gift from a loved one. 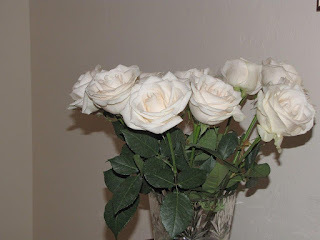 Have you noticed, for the last couple of years, commercial roses have little or no fragrance? That's why I cherish those picked fresh from my garden. Does anyone know of a florist in Tucson that sells roses that have an aroma? Please let me know. And who do you want to send a bouquet to today? And for what reason? I especially want to send these flowers to special friends: Mary S., Linda D., Minka, Beth, Jodi, Paula, and Marianne. You have been helping me grow in special ways. Thank you for being in my life.